Chocamocha Cosmos This annual is a ‘Proven Winners’ plant. 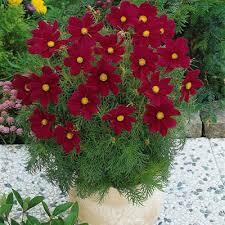 Chocamocha Cosmos has deep chocolate maroon daisies that have a chocolate fragrance. They will grow from 10" to 12" tall and 12" to 16" wide. Plant in full sun to partial sun in well drained soil. Chocamocha Cosmos will attract butterflies and hummingbirds and also makes a great cut flower. Use Chocamocha Cosmos as a Filler in hanging baskets and containers, plant in an annual border, or plant several in a planting bed. Cut and put some in a vase for a wonderful cocoa aroma. Sonata Carmine Cosmos has dark maroon daisies that have a yellow center. They will grow from 22" to 24" tall and 12" to 14" wide. Plant in full sun to partial sun in well drained soil. Sonata Carmine Cosmos will attract butterflies and hummingbirds and also makes a great cut flower. Use Sonata Carmine as a Thriller or Filler in hanging baskets and containers, plant in an annual border, or plant several in a planting bed. Cut and put some in a vase for a wonderful tabletop vase. Add in some yellow cut flowers or a great color combo.